A new report from Universities UK underlines the positive impacts that international students have on the UK’s economy and society, and warns that government policy is impacting the country’s competitiveness as a leading global study destination. It also shows that the composition of the international student body in the UK is changing over time; in particular, that South Asia is contributing fewer students and East Asia is sending more. The report, International students in higher education: the UK and its competition uses data from the UK Higher Education Statistics Agency (HESA) as well as a 2014 survey of Universities UK members to assess the international competitiveness of the UK’s higher education sector. The resulting analysis reveals signs that international student enrolments in UK higher education institutions are growing again in 2014 after modest declines in 2011/12 and 2012/13. But it also reveals significant and continuing drop-offs from important sending countries such as India and Pakistan. The comparatively weak efforts by the UK government to bolster the country’s reputation as a welcoming study abroad destination. “For the UK, a return to sustained growth in international student recruitment is not a certainty in the current climate,” says the report. “With a spotlight remaining on the wider issue of immigration in public discourse, and with students constituting the largest portion of non-EU immigration, higher education institutions remain implicated within the government’s drive to reduce net migration to the ‘tens of thousands’. Perhaps the best place to begin in order to contextualise the Universities UK report is with HESA statistics. First, we should understand that non-EU students composed roughly 13% of the total UK student population in 2012/13, up from 10% five years earlier. While over five years, the proportion of non-EU students in UK institutions has become larger, over the past couple of years the total non-EU student population in the UK has dropped. 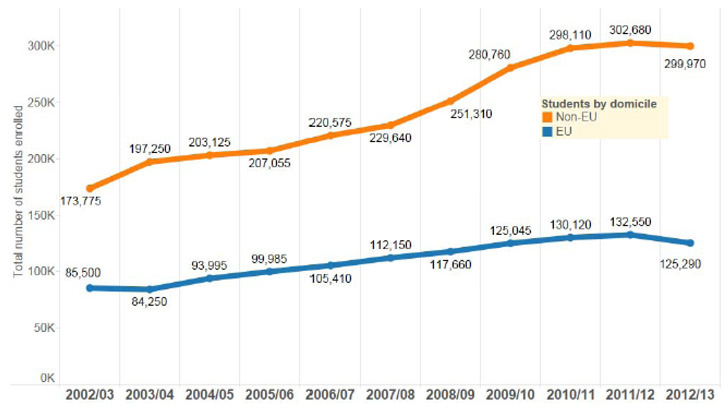 There were 302,680 non-EU students in 2011/12 and 299,970 in 2012/13. This is a small drop, but it represents a major reversal from the steady and sometimes very significant increases up to that point. As for EU students studying in the UK, there’s been a decline of over 5% (132,550 to 125,290). Furthermore, the number of international students entering UK courses for their first year has been sliding down since 2011, with postgraduate commencements – the most popular level for international students coming to the UK – falling 4% from 2010 to 2012. Together, China and India constitute the greatest proportion of non-EU international students in the UK, and their combined proportion grew from 36% in 2008/09 to 40% in 2012/13. 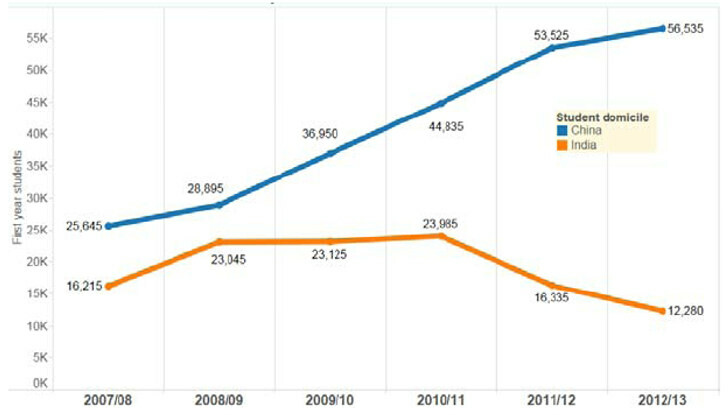 However, while Chinese enrolments have increased over this period, Indian enrolments have been falling. There is also a broader regional trend emerging, with more enrolment coming from East Asia than from South Asia. 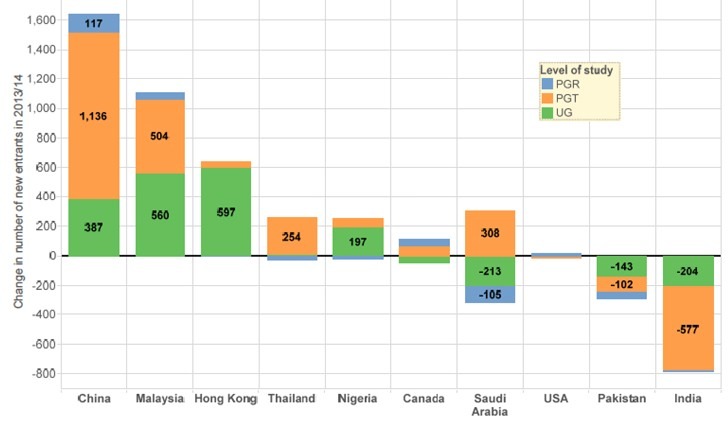 Countries sending high proportions of undergraduate students (e.g., Hong Kong, Malaysia) are sending more students than they have in previous years, but countries sending high proportions of graduate students (e.g., India, Nigeria) are sending fewer. This is significant because many graduate courses in the UK are subsidised by tuition fees from international students. A similar phenomenon exists for STEM subjects, and international entrants to these courses have fallen by 10% in two years. If international enrolments in STEM areas continue to fall, they could make certain STEM courses/programmes unviable and thus unavailable for domestic students as well. The HESA data for 2013/14 is not yet available; in the meantime Universities UK surveyed 104 member institutions in spring 2014 to get a sense of trends in the 2013/14 academic year. Overall, members were more likely to report growth in international student commencements than declines, and said that China, Malaysia, and Hong Kong are driving the growth, with applications also increasing from prospective Saudi Arabian, Brazilian, and American students. But the survey also revealed a continuing trend of declines from India and Pakistan. “In 2013, the number of Indian students enrolled in higher education in Australia increased by 33% to 16,732. The number of Pakistani students enrolled also grew in 2013 – by 39% to 5,681. More recent data suggests that growth is continuing. 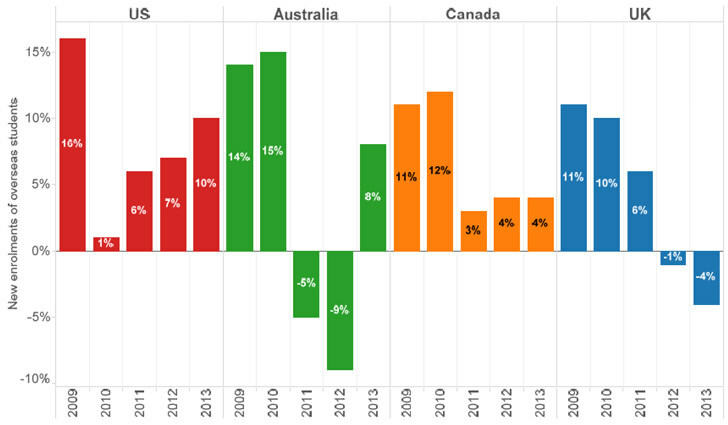 More broadly, the report notes that among the major destination markets of the UK, the US, Canada, and Australia, the UK was the only one to experience a decline in international entrants in 2013/14. “A 2013 survey carried out by IDP Education of 1,100 students across Asia and the Middle East showed that, when it comes to the perceived quality of education, the UK is second only to the United States across the five main English-speaking destinations, with Australia and Canada close behind, and New Zealand fifth. The report also cites the ICEF i-graduate Agent Barometer study, which shows how agents’ perception of the UK as an attractive destination has fallen from 2008 to 2013 – in contrast to Canada’s increasing attractiveness. Most worrisome perhaps is a 2014 National Union of Students (NUS) survey that showed that more than 50% of current international students in the UK feel unwelcome, and 19% would not recommend the UK as a study destination to their friends or relatives. This is a particularly worrying finding as other research in the field shows that a country’s attitude toward international students is highly influential in applicants’ choice of study destination. Post-study work opportunities in the UK are also shown to be less attractive than those in other countries. The report cites a 2013 Ipsos MORI survey that revealed that 91% of Indians considering studying abroad believed the UK’s restrictions on post-graduation work opportunities would put off some or most students. And of those Indians who opted not to go to the UK, 38% said it was because they doubted they would be able to work in the UK post-graduation. The UK currently commands a 12.6% share of the world’s internationally mobile students, second only to the US. Put another way, the total spending by international students on fees, accommodation, and other consumer expenses in the UK was more than £7 billion (US$11.24 billion) in 2011/12. Enhanced post-study work opportunities for international graduates. “We must do all we can to welcome genuine students who wish to study here. We do not want to lose our leading position as a destination for the increasing numbers of students who want a higher education overseas…. This entry was posted in Europe, Higher Education, Most Popular, Regions, Research, United Kingdom and tagged higher education statistics, student mobility, visa processing, universities with international students, student recruitment.